'Stratovision' sounds about as serious as 'Wonkavision,' but unlike the candy maker's fictional machine that transported chocolate bars across the room, Stratovision was in fact a serious proposal. It was an early form of satellite television. Since orbiting communications satellites would not be practical for another decade, Westinghouse devised a system in 1945 using aircraft flying at high altitude to relay television signals. Engineers calculated that 14 airplanes circling at 25,000 feet could provide coverage to 78% of the country. 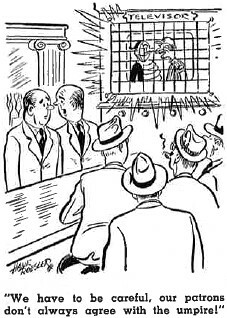 By 1950 they had a working system, but needless to say (because nobody has ever heard of it... except you, now), the concept ultimately did not pan out. It was not because the system failed to work as designed, but because there was not enough demand for coast-to-coast broadcasts at the time. Stratovision is mentioned in this "On the Air: The Story of Broadcasting" video (begins at about 21:00). See the article titled "MPATI - Its Problems & Solutions," in the May 1963 issue of Radio & Television News magazine. The experimental Stratovision station (a modified B-29). flying at 25,000 feet over the Pittsburgh area, rebroadcast telecast picked up from the east coast television network over an estimated area 525 miles in diameter. Programs from the ground stations are picked up on the antenna projecting above the tail. and rebroadcast from the long. mast-like antenna extending down from the nose of the plane. Fourteen planes would provide adequate coverage for approximately 78% of the people in the U.S.A. Although Stratovision experiments in the United States have been suspended temporarily, there are many TV authorities who believe it is the only answer to truly adequate "nationwide" video coverage - including the small towns and rural areas as well as the large metropolitan centers of the country. Five years ago (1945), the Westinghouse Electric Corporation, in cooperation with The Glenn L. Martin Company, announced the intention of developing this system in the United States. It is airborne television-transmission relay from planes in motion at high altitudes. By raising the broadcasting antenna to greater heights, relatively large improvements in v.h.f. (very-high frequency) and u.h.f. (ultra-high frequency) transmission range may be obtained. "Radio" horizon distances, of course, are largely dependent upon atmospheric conditions. A transmitting antenna 30,000 feet above the earth's surface has a "line of sight" distance to the horizon of 211 miles, and this distance roughly represents the service area of such a v.h.f. or u.h.f, transmitting antenna. Assuming true spherical earth conditions, calculations indicate that television coverage over this large distance is attainable with powers equivalent to those used in present-day commercial television stations. A transmitter operating at 600 megacycles, airborne 30,000 feet above the surface of the earth, with an effective radiated power of 25 kw. assumed, will achieve a field intensity of 2 millivolts per meter for a 3D-foot high receiving antenna, out to 238 miles. This distance represents the coverage from an airborne station over the earth. Minimum values of field intensity occur at several points closer to the transmitter and fall below the value of two mv/m. required for service. These minimums will not occur at the same distances for a different receiving antenna height. This makes it possible to increase the field intensity at any location by changing (either raising or lowering) the receiving antenna by a few feet. Energy at the receiving antenna arrives from the transmitting antenna over two paths - a direct path and a reflected path. Thus, the net energy at the receiving antenna is a vectorial addition of these two components. As the distance between transmitter and receiver is changed (or the antenna heights are changed), the changing vectorial relationship produces nulls and maximums. There are as many nulls between the transmitter and its horizon as the number of half-wavelengths that the receiving antenna is above ground. It is desirable to reduce the receiving antenna height as the receiver is moved closer to the transmitter, even to the point of laying it close to the ground when the location is near the transmitter. Naturally, terrain factors influence the coverage obtained, and these factors have a greater attenuative effect in the u.h.f. television band than in the v.h.f. band. 1) C. E. Nobles, originator of the Stratovision system for airborne television and frequency modulation transmission, monitors the television signal received and transmitted from the Stratovision airplane. Ben Carroll (shown at right), Martin Stratovision project engineer, listens at the sound monitoring position. 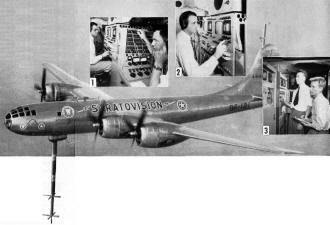 2) C. E. Nobles at the twin video monitoring boards in the experimental Stratovision airplane. The boards are so arranged that each can be used separately to monitor the video signal coming to the plane or the signal being transmitted by the plane, or they may be used together so that the signal picked up by the plane appears on one screen while the plane's broadcasted video signal is monitored on the other. The TV picture is viewed on the large screen. 3) Angus A. Macdonald and Larry Smith, Westinghouse engineers, record current and voltage readings of the 1000 watt transmitter used to rebroadcast frequency modulation sound signals from the airplane. This transmitter plus the TV transmitter and the other equipment aboard the plane generated so much heat in early flight tests that a refrigeration system, capable of air conditioning a seven room house, was installed promptly. Two transmitters were installed in the unpressurized cabin of this ship. A 250-watt transmitter, operating on 107.5 mc., and a 5 kw. (peak of pulse) transmitter operating at 514 mc., were flown at various altitudes away from Baltimore (Maryland), and continuous recordings of field intensity were made at locations ranging from Norfolk (Virginia), to Pittsburgh (Pennsylvania), and Boston (Massachusetts). During the one-year flight-test period using PV-2, measured field intensities were compared with calculated values and effects of motion of the plane upon the pulsed waveform of the 500 mc. transmitter were studied. No effects of the motion of the plane were found except for the expected variation of field intensity as the distance changed. Measured field intensities agreed with calculated values reasonably well when the receiving antenna site approached a true spherical earth condition. Departure below predicted values was noted when the receiving antenna was down behind a hill. In a comparison study of measured and calculated values when the receiving antenna was set up on a beach at Norfolk (Virginia) - the total path between transmitter and receiver being over the waters of Chesapeake Bay - it was noted that even with this ideal "spherical earth" location, the minimums were never as deep as calculated. As a result of these tests, the two companies were encouraged to equip a .more suitable plane for actual picture transmission in accordance with commercial television standards. 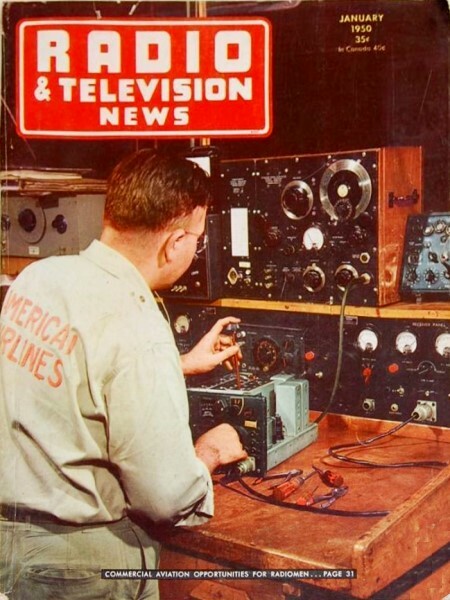 A complete set of modern TV transmission equipment was built and installed in a B-29 "Super Fortress" with all military armament removed to make room for the TV equipment. This aircraft is a pressurized, four-engine, high-altitude airplane capable of operation at 30,000 feet. Television equipment installed in this ship consisted of receivers capable of receiving standard commercial television stations or a special 547.5 mc. relay link from the Westinghouse studios in Baltimore (Maryland). Transmitting equipment capable of emitting 5 kw. of video and 1 kw. of sound on TV Channel 6 (82-88 mc.) and monitoring and control equipment were also installed. In addition, other transmitters operating on 250 mc. (with 200 watts c.w.) 750 mc: (with 200 watts c.w. ), and 3300 mc. (with 50 kw. peak of pulse) were installed to carry out further propagation measurements. Receiving circular dipoles were located on an eight-foot streamlined mast atop the vertical tail fin. These antennas were used to receive standard ground stations for rebroadcast. The vertical tail fin was chosen as a location for the receiving array because it was the spot most isolated from the transmitting array, thereby reducing the problems of receiving weak signals in close proximity with the 5 kw. video and the sound transmitters. This location plus the use of filters made it possible to receive any commercial channel except Channel 5, where the lower sideband components of the Channel 6 transmitter were relatively high. In broadcasting position, the main transmitting antenna mast hung vertically downwards. This mast carried a two-element turnstile array for the Channel 6 video carrier, a single-element circular dipole sound antenna, and a 547.5 mc. relay link receiving array. The mast is 28 feet long and induced some 600 h.p. of additional drag to the plane in spite of its being streamlined. This array, of course, was retractable for take-offs and landings. Power for all equipment was obtained from three 15 kva., 500-cycle alternators coupled directly to the plane's engines. The plane used a 70,000 BTU-per-hour air conditioning system in order to dissipate the heat from the operating compartment. Without air conditioning, the compartment temperatures reached 134 degrees Fahrenheit in spite of the fact that outside air temperatures were 25 degrees Fahrenheit. This equipment was flown more or less regularly from June of 1948 to February of 1949. Usual flight procedure after take-off from Baltimore (Maryland) was to climb to operating altitude at Baltimore. During the hour required to climb, equipment was brought on the air and checked out. Upon reaching altitude, the plane was flown away from Baltimore while continuous propagation measurements and range measurements were being made. The programs of WMAR-TV of Baltimore usually were broadcast on Channel 6. After each flight, many TV fans wrote in to describe results of the test at their particular location. These reports from the public were numerous; several hundred letters were received on some flights and proved to be a valuable source of information. Area covered by reports agreed very well with predicted coverage. An angle of five degrees or greater is obtained for only the first mile from a 500-foot high antenna compared with 64 miles from the 30,000-foot antenna. An angle of one degree or greater is obtained for only 5 miles from a 500-foot high antenna as compared with 168 miles from the 30,000-foot antenna. Stratovision proponents estimate that it would require only eight planes in "relay" to provide a transcontinental network and six additional planes to give adequate coverage to 78 percent of the 149,000,000 people in the United States. As to the future of airborne TV, C. E. Nobles, head of Stratovision work for Westinghouse, says "The major technical problems of the system have been solved, and the commercial development awaits only the crystallization of public demand for the expanded services offered by airborne broadcasting, application of the system by the radio industry to meet this demand, and the clarification of channel facilities available to make possible this application."